There are four muscles in the anterior compartment of the leg; tibialis anterior, extensor digitorum longus, extensor hallucis longus and fibularis tertius. Collectively, they act to dorsiflex and invert the foot at the ankle joint. The extensor digitorum longus and extensor hallucis longus also extend the toes. The muscles in this compartment are innervated by the deep fibular nerve (L4-S1), and blood is supplied via the anterior tibial artery. 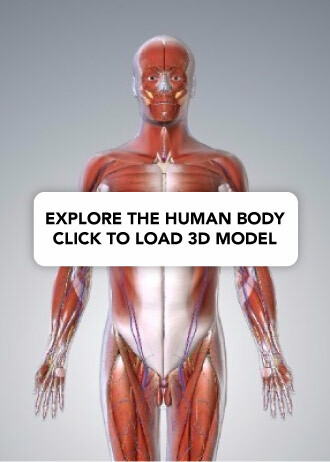 In this article, we shall look at the actions, attachments and innervation of the muscles in the anterior compartment of the leg. The tibialis anterior muscle is located alongside the lateral surface of the tibia. It is the strongest dorsiflexor of the foot. 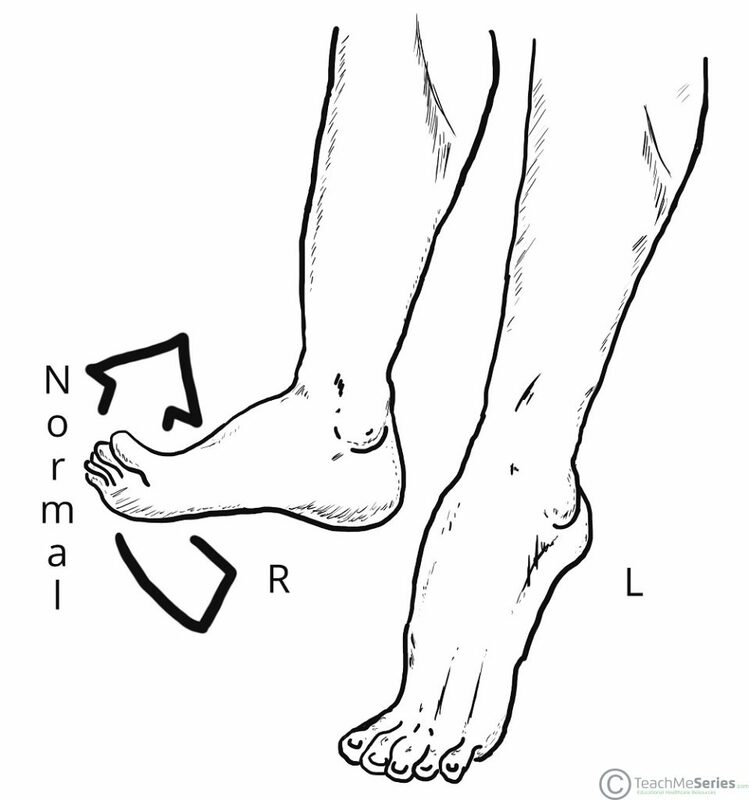 To test the power of the tibialis anterior, the patient can be asked to stand on their heels. Attachments: Originates from the lateral surface of the tibia, attaches to the medial cuneiform and the base of metatarsal I. Fig 1 – The muscles of the anterior leg. The extensor digitorum longus lies lateral and deep to the tibialis anterior. The tendons of the EDL can be palpated on the dorsal surface of the foot. Attachments: Originates from the lateral condyle of the tibia and the medial surface of the fibula. The fibres converge into a tendon, which travels to the dorsal surface of the foot. The tendon splits into four, each inserting onto a toe. Actions: Extension of the lateral four toes, and dorsiflexion of the foot. 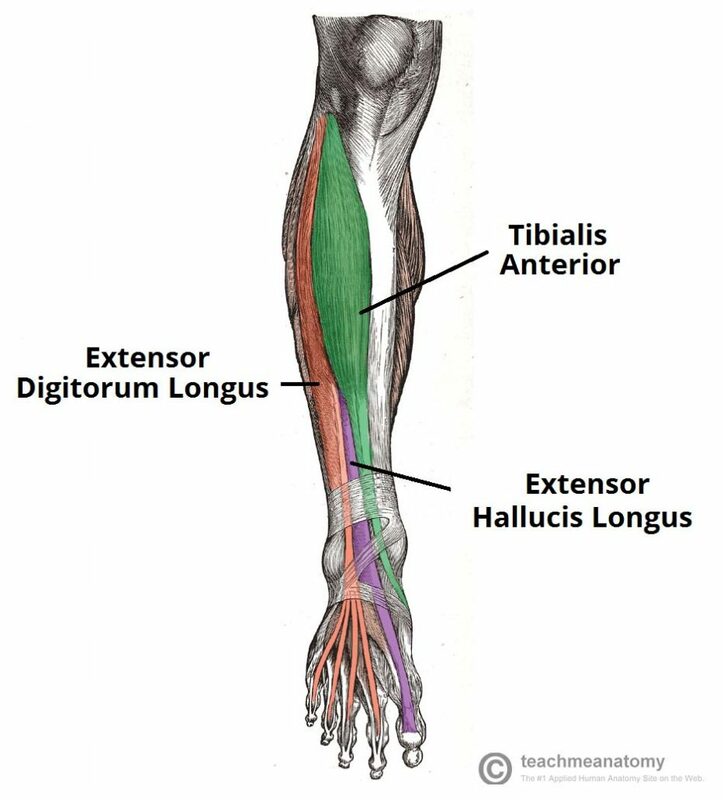 The extensor hallucis longus is located deep to the EDL and TA. Attachments: Originates from the medial surface of the fibular shaft. The tendon crosses anterior to the ankle joint and attaches to the base of the distal phalanx of the great toe. Action: Extension of the great toe and dorsiflexion of the foot. Fig 2 – Lateral view of the tendons of the foot. The fibularis tertius muscles arises from the most inferior part of the EDL. It is not present in all individuals, and is considered by some texts as a part of the extensor digitorum longus. Attachments: Originates with the extensor digitorum longus from the medial surface of the fibula. 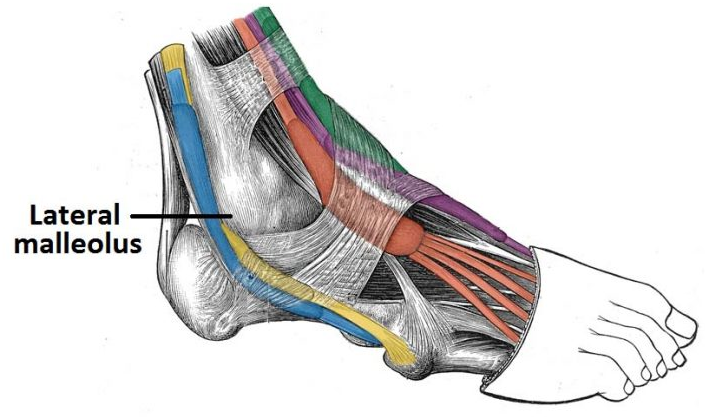 The tendon descends with the EDL, until they reach the dorsal surface of the foot. 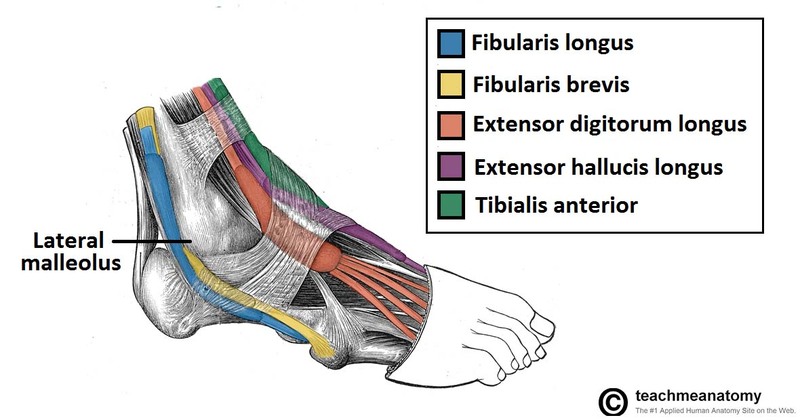 The fibularis tertius tendon then diverges and attaches to metatarsal V.
Actions: Eversion and dorsiflexion of the foot. Footdrop is a clinical sign indicating paralysis of the muscles in the anterior compartment of the leg. It typically occurs as a consequence of damage to the common fibular (peroneal) nerve – from which the deep fibular nerve arises. In footdrop, the muscles in the anterior compartment are paralysed. The unopposed pull of the muscles in the posterior leg produce permanent plantarflexion. This can interfere with walking – as the affected limb can drag along the ground. To circumvent this, the patient can flick the foot outwards while walking – known as an ‘eversion flick‘. Fig 3 – Left footdrop. This can occur following common fibular or deep fibular nerve palsy. Below is an illustration of the tendons of the anterolateral foot. Which structure has been highlighted in red? Listed below are the muscles of the anterior leg. Which produces eversion at the ankle? What are the nerve roots of the deep fibular nerve?